KDE 4.11 was released few days back. And this latest KDE release has many important characteristics. First off, KDE 4.11 marks the end of Plasma Workspaces 1, part of the KDE SC 4 feature series. Focus of feature development will shift to Plasma Workspaces 2 now, performance improvements and bugfixing will concentrate on the 4.11 series. And to ease the transition, KDE 4.11 will be supported for at least two years. The taskbar Plasma widget has been ported to QtQuick, resulting in more consistent and fluent behavior while retaining its old look and functionality. 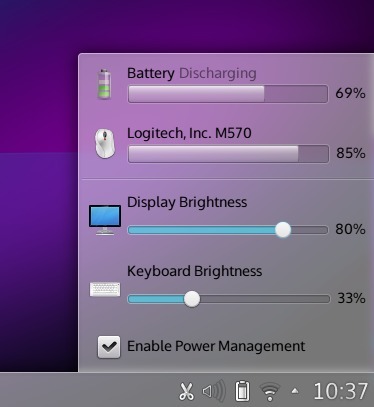 The battery widget now supports keyboard brightness, and can deal with multiple batteries in peripheral devices, such as your wireless mouse and keyboard. It shows the battery charge for each device and warns when one is running low. Notification popups now sport a configure button where one can easily change the settings for that particular type of notification. KMix, KDE's sound mixer, now has full media player control support. More intelligent multi-monitor support with KScreen. How to Install or Upgrade to KDE 4.11 in Ubuntu 13.04, Ubuntu 12.10, Ubuntu 12.04? Brand new KDE SC 4.11 is already installable in Ubuntu 12.04 and up. The following commands should work in Linux Mint too, though I have only tried it with Ubuntu 13.04. For most people, kde-standard must be good enough. But if you want the entire gamut of packages associated with Kubuntu, install kubuntu-desktop as well. .Now, if you have already installed KDE and want to upgrade it, do this instead. Done. Logout and select KDE from the login screen to experience KDE 4.11. PS: KDE has dedicated this release to the memory of Atul Chitnis, a great Free and Open Source Software champion from India. Atul led the Linux Bangalore and FOSS.IN conferences since 2001. KDE India was born at the first FOSS.in in December 2005.